Studio Brain is an exhibition of work by two artists for whom the environs of the studio have become an integral and active part of their respective thought processes. In this conception the studio acts like a physical extension of the body, a repository and conduit for ideas in a kind of ‘art brain’ generating images and artefacts. This is a show about two different approaches to the creation of a self-contained studio practice; the studio (approached from the left side of the brain) is considered on the one hand as concept, and from the opposite perspective (from the right hand side of the brain) as practice. It is intuition that directs Julian Wakelin to put one form next to, or on top of another, to create layered arrangements of painted marks that satisfy in a way that, almost as a defining characteristic, cannot be adequately described in written form. This is a purely visual practice guided by a cognition developed over long hours in the studio, and still more with his ‘head in the studio’, thinking about its contents and the current state of play. He has a constant preoccupation with the practice of painting. At any given moment dozens of canvases are on the go in the studio, all feeding off one another; referencing, reworking and refining each-others’ moves and gestures, creating a current of studio production. It is the integrity of this process, and its apprehension in the layers of decision-making made visible in the works that makes them both generous and rewarding. In 2012 Ross Hansen stopped making new images. A belief in the fundamentally cyclic nature of artistic production and the impossibility of originality has led the artist to invert or fold his practice in-on-itself, to start re-making ‘new’ works from his own back catalogue. The Replica Paintings are distillations, re-makes of provisional or formative stages of production from absent, or unidentified ‘originals’; whereas the Back Catalogue drawings painstakingly document the minutiae of the artist’s working practice, as revealed by the detritus and by-products accumulated through the process. Neither strategy seeks to resolve images via conventional, pictorial means; rather they represent respectively minimal and maximal approaches to the task of ‘holding a mirror up to the studio’. These are parallel production lines, set-up to record and re-record their own condition in a self-sustaining studio ecosystem that could potentially continue ad infinitum. 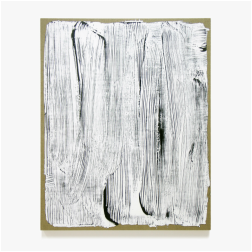 The two artists in this show both reject the notion that anything like a definitive statement or outcome can be reached within the context of contemporary painting, yet find a compelling value and worth in the practice nonetheless. They have found ways to make paintings and drawings with no start or end points, but that exist in a kind of a-temporal continuum of studio production. Julian Wakelin (1968, UK) studied Painting at Leeds Metropolitan University. Recent shows include The Opinion Makers II, Lubomirov-Easton @ LONDONEWCASTLE Project Space (2014/15) and Summer Saloon Show at the Lion + Lamb (2014). He was a finalist in the John Moore’s Painting Prize 24 and the subject of an extensive essay by the critic Peter Suchin, in Turps Banana Issue #5. He lives and works in Hackney, London. Ross Hansen (1973, UK) completed a BA in Fine Art at Newcastle University and an MFA at The Slade School of Fine Art. Recent solo shows include The Missing Archives at Stephane Simoens Contemporary Fine Art (2014) and Back Catalogue at Art Brussels (2013). His work is included in public and private collections across Europe including FRAC Languedoc-Roussillon and UBS Warburg. He lives and works in Walthamstow, London.